The 2017 Super Mod Cup Contest turns on high with loading casters, cabover steps, refrigerator fans, a BBQ swing arm, WIFI extender, and an anti-scratch Chihuahua grid. Welcome to the January 2017 Super Mod Cup Contest. Please review the following ten Medium Mods and vote for your favorite mod. We will announce the January 2017 Super Mod Cup Contest winner next week. For more information about the monthly mod contest, including how to enter, click here. Congratulations to Brian Sibbles for winning this month’s contest! 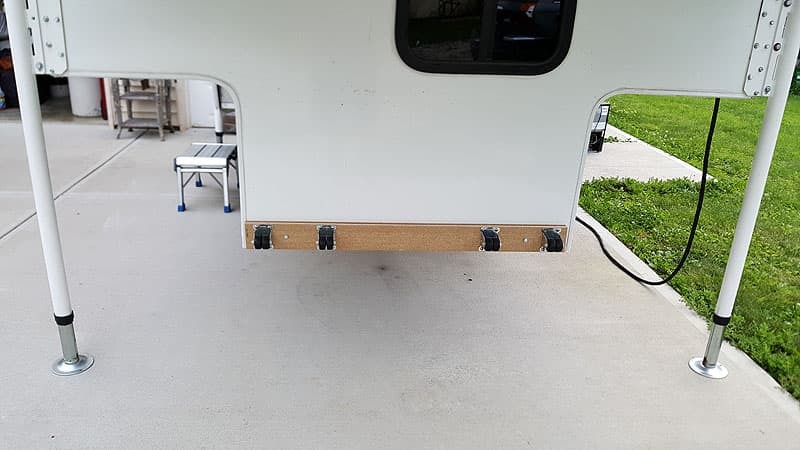 This modification was made to help with loading the camper and to replace an inferior component. I removed the damaged bumper stop and replaced it with a series of low cost casters mounted to a piece of composite deck material. I bolted the decking using the existing bumper holes. I have a 2×10 piece of wood placed in front of my truck bed for the casters to roll against. 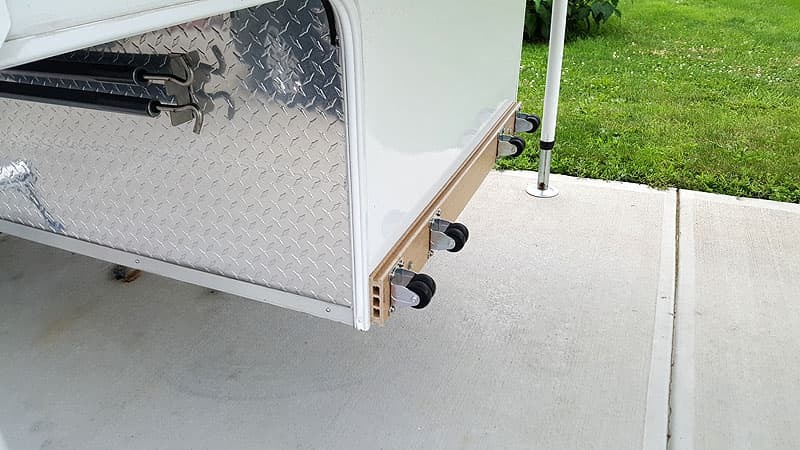 No more deformed bumper stops or worrying about camper height prior to lowering into bed of truck. This modification has worked great! It took me one hour to complete this modification and cost me $30. In my opinion, the skill level of this modification is easy. It seems it’s always the men entering their mods typically involving fancy electronics or heavy machinery. Here is one for the ladies (excuse my stereotype). 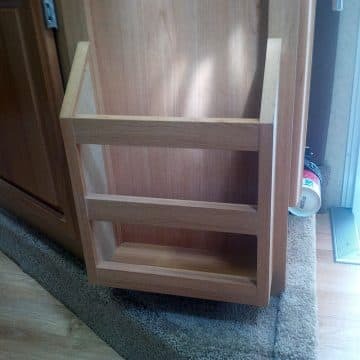 Most every camper has a magazine rack. Ours holds woodworking magazines (my husband fits that stereotype as well). 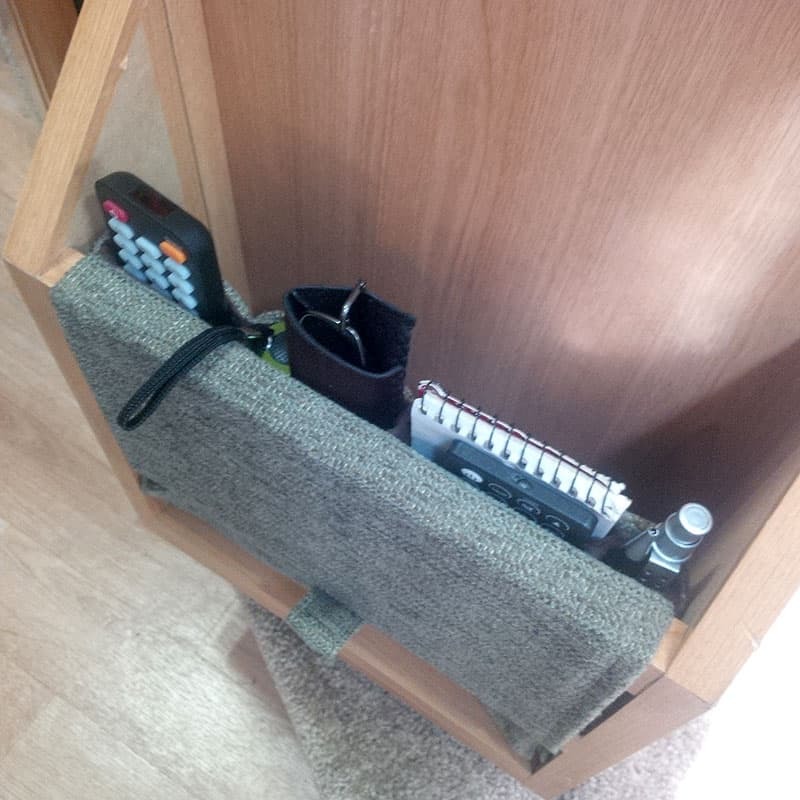 I found this to be a highly inefficient use of the space available, so I made a magazine rack organizer. 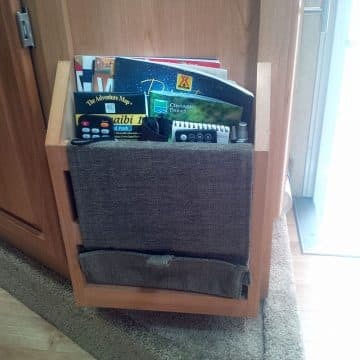 My magazine rack-organizer keeps all those odds and ends at our fingertips; remote controls, pens, paper, eye-glasses, flashlights, charging cables, etc. And yes, it still holds magazines. 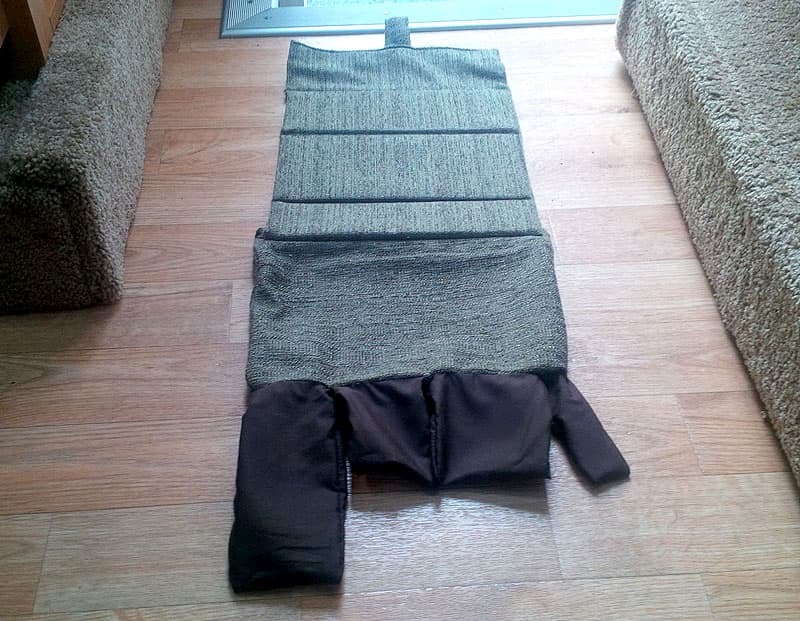 You can make the pockets a custom size to suit your own needs or even create a padded tablet pocket with the addition of some quilt batting.